NEW RESEARCH FROM Trinity College has found that plastic litter is smothering marine life in Irish coastal marshes and even ‘biodegradable’ bags are having the same negative impacts as less environmentally-friendly options. The study led by Dr Dannielle Green, an IRC-funded Research Fellow in the Biogeochemistry Research Group at Trinity College, found that in just nine weeks plastic bags smothered the surface of coastal sediment, prevented oxygen and nutrient flow, and blocked light. This caused a substantial reduction in the amount of ‘microalgae’ beneath the bags. These tiny algae form the base of the food webs and makes them important for animals higher up the food chain, including worms and bivalves, such as clams and mussels. These species, in turn, are food for commercially important fish that feed within the marsh when the tide is in. 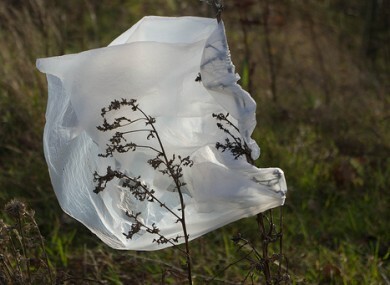 “The same effects were there regardless of whether the plastic in question was biodegradable or not,” Green explained. Biodegradable plastics are produced because they are thought to be better for the environment because their persistence is shorter, but our study suggests that the rate at which they break down may not be fast enough to have any meaningful advantage over conventional bags in marine habitats. Though it is already well known that plastic litter is harmful to organisms, this study showed that it can affect them within a matter of weeks. A plastic bag levy in Ireland was first introduced in March 2002 and figures from 2013 showed it had raised over €200 million. Though many other nations since 2002 have considered or are considering similar legislation, the production of plastic has increased from 1.5 million tonnes in the 1950s to around 300 million tonnes in 2013. Of this, single-use packaging items account for almost 40% and a not-insignificant portion could end up in the marine environment as litter, transported via wastewater flows, inland waterways, wind or tides. Plastic litter currently accounts for up to 80% of all litter found in marine habitats. According to Green, even if plastics degrade and seem to disappear, they persist as micro-plastics and could cause harm to marine organisms that ingest them. Email “Plastic bags are still damaging the environment ”. Feedback on “Plastic bags are still damaging the environment ”.